Lairon in game: 960 Who? Important notice! Pokemon Lairon is a fictional character of humans. Lairon smashes its steely body against others in battle over territory, and shows off its strength with the size of sparks it composes by ramming into rocks. 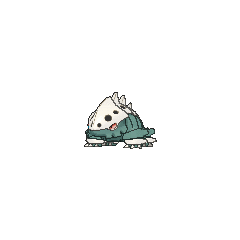 It drinks nutritious mineral spring water and feeds on iron contained in rocks. 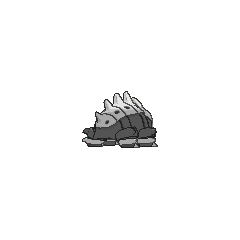 It builds its nest on mountains where iron ore is buried, which results in it clashing with humans that are iron mining. Lairon made its debut appearance in A Fan with a Plan under the ownership of a Coordinator named Savannah. 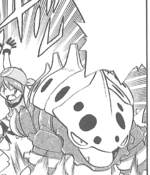 In the following episode, it was used in the Battle Stage of the Rubello Contest, where it defeated May's Bulbasaur but lost to Drew's Masquerain. Lairon also appeared in, rampaging, Steeling Peace of Mind!. Lairon also appeared in A Pyramiding Rage! under the ownership of Paul. It battled against Brandon's Regice, but was defeated quickly. Lairon also made a cameo in Numero Uno Articuno as a Pokémon belonging to Noland. 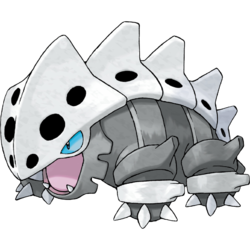 Lairon, together with its evolutionary family Aron and Aggron, appeared in Giratina and the Sky Warrior where it helped Ash and his friends to stop the glacier. A group of Lairon also appeared in Genesect and the Legend Awakened at Pokémon Hills. A Lairon appeared in Tag Team Battle Inspiration!. A Lairon appeared in Meeting at Terminus Cave! inside the Terminus Cave. Rono, Sapphire's Aron, evolved into a Lairon before her challenge with Brawly in the Dewford Gym. Although it was, having newly evolved, her highest-level Pokémon, it failed to beat his Hariyama, but was put into good use against Aqua Admin Matt, beating his Pokémon and injuring him badly enough that he was not taken to the Seafloor Cavern sometime later. It evolved into an Aggron on Mirage Island as a result of the training Sapphire underwent alongside Ruby. 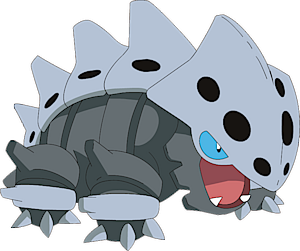 It habitually shows off its strength with the size of sparks it composes by ramming its steel body into boulders. It habitually shows off its strength with the sparks it composes by ramming its steel body into boulders. Lairon may be based on the Pulgasari, a monster that eats iron in Korean legend. It also has a similar body shape to the Placerias, a mammal-like reptile from the Triassic period.